How can I possibly top this meal? I mean...can I? What in the name-of-all-that's-freakish am I thinking with this meal other than the fact that some red-blooded-American boys are going to just want to kiss me! This is about as meat-n-'taters as one can get when it comes to a meal...and add to that the fact that it is shelf stable 3 years! It's loaded with real tender beef, mushrooms and onions in a savory gravy... Oh dear. Bless my ever-prepared-heart. Speaking of that, I'd like to thank my darling friends at Honeyville for providing the bulk of ingredients used in today's post! They have been so kind as to ask me to write their food storage cook book and many of my meal-in-a-jar recipes will be included in that book. My 52 jar method Meals in a jar will be the theme all week! So, if you like what you see, plan on visiting all week. I'll try to have at least 4 new posts up this week with new recipes and some that I've re-vised to be more natural and user-friendly. If you are new to the meals in a jar, go here and get some details on how the meals are done as well as the basic safety guidelines. If your scroll through the rest of the 52 jar method posts, there are a lot more recipes, ideas, and helpful tips when making the meals. I answer a lot of questions in the comment sections as well. If I had to re-cap each detail in each new post, it would take a lot of time and space. So. That being said there are a few things I will always re-cap in each post. First, however, I'm gonna say, "Duuuuude! 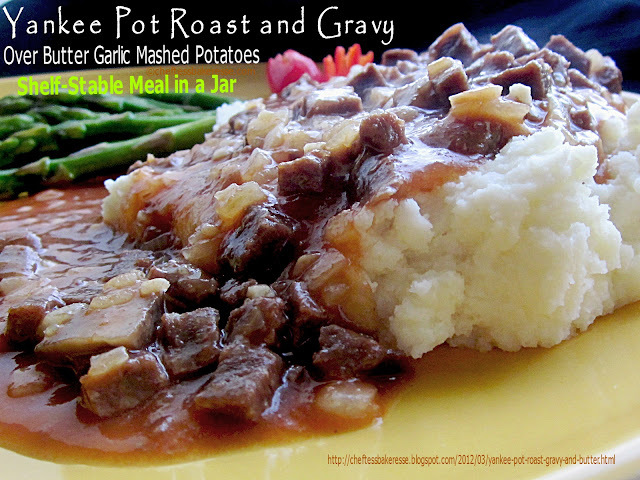 I got that Yankee Pot Roast Gravy and Butter-Garlic Mashed Potatoes right out of this jar." I know...it's hard to believe how cool this is. Try not to pass out. This ends up making 4 cups of thick buttery-garlic mashed potatoes and 4 cups of this savory pot roast gravy with mushrooms and onions. It's a hearty filling meal. Bet you'd never believe so much food could come out of this little space right?! So what's the down-low on the jars?! 1. You will be using a method some have called "dry pack canning" but it's actually called Vacuum packing. No liquid or pressure canning is necessary. If you opt to use the freeze dried meat in the recipes NOTE: The repacking of Freeze Dried Meat must be done within 24-48 hours of opening the can and must be done in a dry environment. Once repacked you must use an oxygen absorber to make sure there is a vacuum oxygen free environment. I recommend using a 300 cc oxygen absorber for each jar. This will make the vacuum packing effective. You can use a food Saver with a jar attachment for this in place of the oxygen absorber, but will need to make sure your machine is designed to be used with the jar attachment. Some of the food Savers are called "meal savers" and are actually not designed to use with the attachment. I called the FoodSaver company myself to be sure that the attachment I had was right for the machine I was using. 2. You can also pack in mylar bags (the ones that are silver-colored), but again need to use the oxygen absorber. This size I use is designed to absorb a gallon size amount of air, but I'd rather err on the side of over-vacuum than not enough. No. You can't use the foodSaver clear plastic bags for long term storage. They are not designed for that purpose. When I say "long term" I'm talking 3-5 years. Put the gravy ingredients in the bottom of a quart size jar, making sure it is a very dry day when re-packing the meats. Shake the powdered ingredients into the solid ones. To add the potato layer, place a sandwich size zipper bag inside the jars. I'm not going to lie. I'm a huge fan of the Potato Pearls. They make a more compact "bang for the buck" in the small space we have in the jars. Flakes will work but it will take about 2 cups of those and you will need to add seasoning. Potato pearls are already pretty buttery and have a good flavor. They don't have as long a shelf life as other potatoes, thus the 3 years instead of 7-10 as we've had with other meals. Place the pearls in the baggie while it is in the jar and add the butter powder and the garlic. You can find these at the Honeyville retail stores but not at their online store. Seal up the bag and then put an oxygen absorber at the top of the jar, being sure it is inside the jar and not at all on the rim. Oxygen absorbers need to be done all at once at the very end of packing since once you open the package of absorbers, they start chemically bonding with air. They are a ONE TIME use. Once they've done their job, the make a dramatic-swooning exit and will never be alive again. So...plan accordingly. They need to be packed within 20 min to an hour of opening the bag from whence they came. Swoon. Swoon. Top with a new clean lid and tighten the canning ring as tight as you can. In about an hour, the jar lid will pop, letting you know a vacuum has been achieved. Carefully remove the bag of potato pearls by opening the bag and emptying a little into a 2-quart metal bowl and then easing the baggie out of the jar. Pour the entire contents of the potato baggie into the bowl. Pour the gravy mixture into a 2-quart pot. Add 4 cups of very hot water to the gravy mix. Whisk well. Place on a stove and bring to a simmer 15-20 minutes. Turn off the heat and leave covered 5 additional minutes. While the gravy sits, heat 3 cups of water in a separate pan. Bring the water to a boil and pour into the potatoes, stirring well. Scoop potatoes onto a plate and top with the hot, chunky, meaty, luscious, savory, divine-ambrosia of beef...Pass out. Wake up with mashed potato on your face and some beef in your eyebrow hairs. Mmm. Pretty. 3. There you go! Enjoy. Share these recipes with your friend! Get the word out that they are here! PLEASE...make sure my name stays with the recipes. Try to think how it would feel if you had worked on the recipes yourself. You'd want not only the credit, but also a way for people to contact you if they had questions. I ask you to please be mindful of that. Plus, they are my copy-written work and that is just the law. Thanks. You never cease to amaze me Tess! Keep those briliant recipes coming.The 52 Method is the most ingenious method I've found to use my Honeywell foods. Can you safely dehydrate cooked meat? I love the freeze-dried but my budget doesn't and TVP and I don't get on. But I really love the idea of the 52 Method and would love to incorporate it into our diet. It would really help me rotate our food storage. I have not tried to dehydrate cooked meat. You can buy the canned beef or pressure can your own and just bottle the potato and gravy parts for the 3 year storage and add the bottled beef to the gravy if you would like. Home bottled beef is only shelf stable 1 year. You can also use vegetables instead of beef if you want to cut the cost or replace half of the beef with veggies if you want to have a shepherd's pie type meal. I've had a few complain about the cost of this meal. The cost on this meal, I realize, is around 9-11$ a meal for a family of 4. Very hearty filling portions! If that is out of your budget, use more of the veggies instead of the beef. Shelf life on this meal is up to 3 years because of the potatoes. Again, use your own dehydrated veggies if you want to lower the cost. You'll have to figure out how much liquid to add to the sauce in order to make it just right for you if you use your own veggies. It will vary depending on the cut of your vegetables. yes I realize that I'm a few months off on this... :)... but I'm just now starting this method of "dry canning". I LOVE all the advice, recipes, and pretty much everything else you've offered to us here! One question though (you've probably answered this a MILLION times but...) - do I need to use an oxygen absorber if I use my food saver to vacuum seal my jars? From what I've read... I do if they contain meat? Is that right? Thanks for all your hard work!!!! Thank you!! Yes. Either an O2 absorber or a foodsaver will work. I wanted to ask about the Haco Beef Base. When I found it online, it is a paste - doesn't that conflict with the whole "everything needs to be dry"? Could you please clarify? How do I pack my jar with it? Thanks much! I'm really liking your site. The one I use is a dry powder. There are a few varieties from them. Let me see what I can do to locate it. Thank you so much!! I appreciate the help! That make SO much more sense! The link in the recipe was broken, but I found the Haco (paste) just thru a google search. Still searching for the Haco Beef Base Powder. I found granules. Will those work Chef Tess? Thanks again for all of this work. I keep finding more exciting info on your website! :) Happy Friday! Tess, love the site, first off. I checked out the Haco site and the beef base only has an 18 month shelf life according to them. You said the shelf life of this recipe is 3 years. Will beef base go bad before the 3 year mark or just lose potency? Thanks. Tess, love the site. Question; Haco's site lists the beef base with a shelf life of only 18 months. You list this recipe shelf life as 3 years. What's the deal with the beef base? Is it no good by the 3 year mark or simply not as potent? Thanks. The beef base doesn't go bad if it is in the oxygen-free environment. The salt takes care of it I can assure you. Thank you for all of the wonderful recipes! I love your cookbook too! I am writing to ask that if I use the potato flakes, you indicated to use 2 cups, but what should I use to season the potatoes and how much of the spice? I do have all of your spices on hand and thought that perhaps your all purpose seasoning would work. I just bought the wrong potatoes! Thank you Chef Tess! 1 tsp of all purpose season should do it. Great question. Many of these recipes for 52 Method are actually too small of portion for my family. Is there any reason why I can't use a 2 qt (half gallon) mason jar? Have you tried this or is it better to just use 1 qt jars & open two at dinner? Yes. The 300cc oxygen absorption is good in up to a gallon size container. I have tried a few of these from the cook book. We have had some issues with wayyy too much tomato powder in a couple of them. A little of that goes a long way. Most of them have been very good. Hi there chef Tess ..so my husband and I have been jarring our own food now for a year or we both love most of your recipes . .I've ask a few people this question to no avail . So maybe you can help..when finding a "regular " recipe and it calls for let's say 4th of tomato paste , how do you converge that paste with tomatoes powder. this recipe looks wonderful. I will be trying it. I have another question for you. I am making spaghetti sauce in a mylar bag for my son. He likes his spaghetti on the sweet side. Can I safely add brown sugar to my recipe? I don't know if it has to much moisture in it.